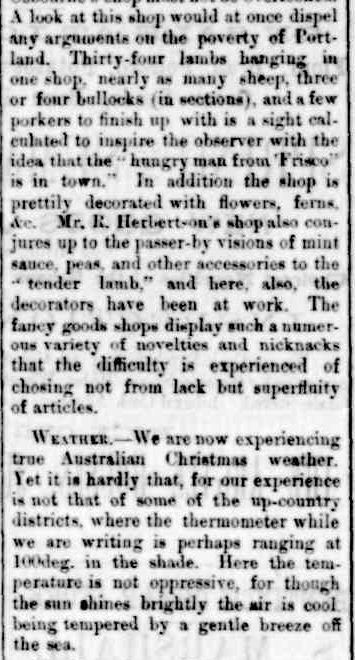 Christmas news in Victoria during the 1880s featured cards, decorations, carols and for something different, the weather. 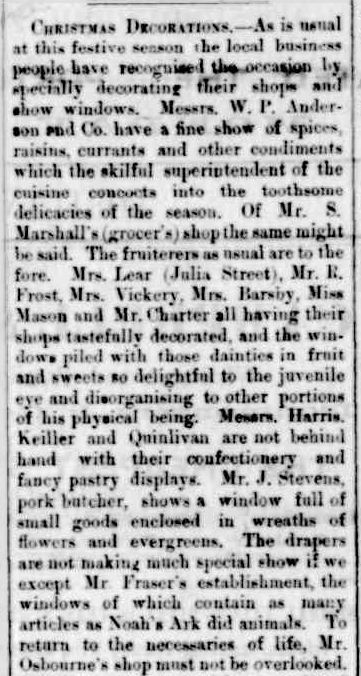 The shopkeepers of Portland in 1880, decorated their shops for the season. 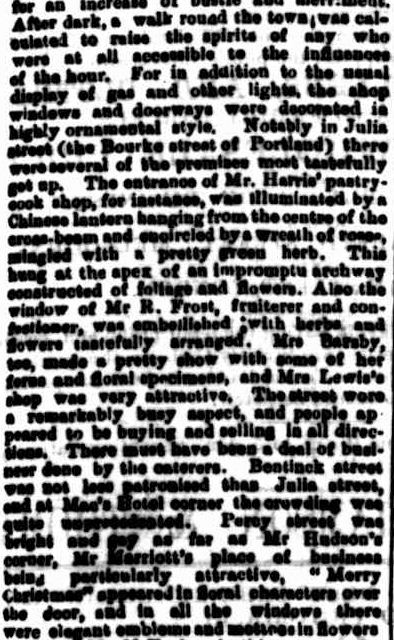 Mr Harris, proprietor of the pastry shop went to great trouble adorning his shop with Chinese lanterns and a wreath of roses. 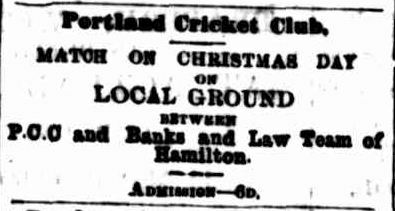 Cricket was a popular activity on Christmas day, a tradition which continues today for many who enjoy a game of backyard cricket after lunch. 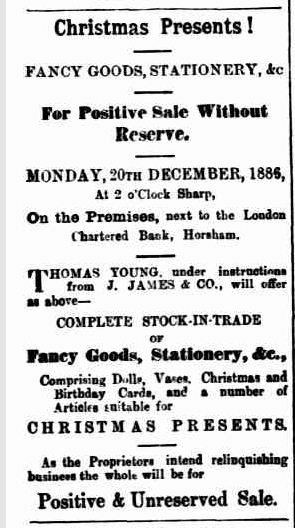 Christmas Day 1885 started quietly before churchgoers began to attend their chosen service. Those not attending church stayed inside until the afternoon when many took advantage of Portland’s coastal position with some boating on the bay. This is a great advertisement inviting the residents of Portland to visit the Christmas tree at the “Guardian” office. “Children, Don’t Forget to Persuade Father & Mother to Come” is followed by “Parents, Don’t Forget the Children”. 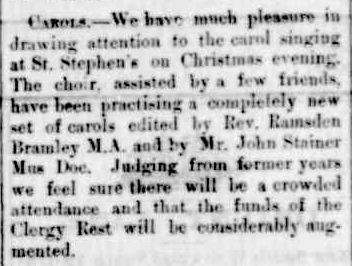 In 1886, St Stephen’s Church was holding the annual carols, but with “a completely new set of carols”. 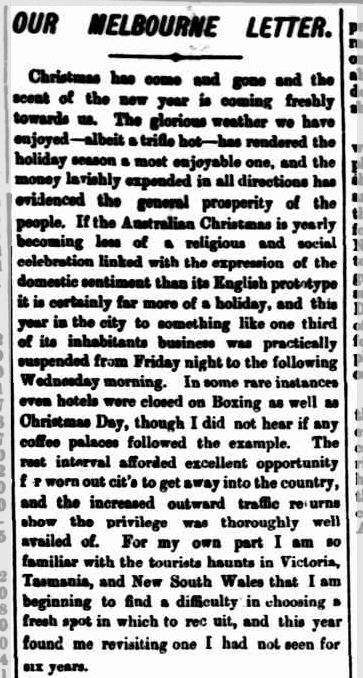 Christmas 1886 in Melbourne saw many businesses closing their doors from Friday to Wednesday to take full advantage of the Christmas holiday. Even some hotels closed on Boxing Day! 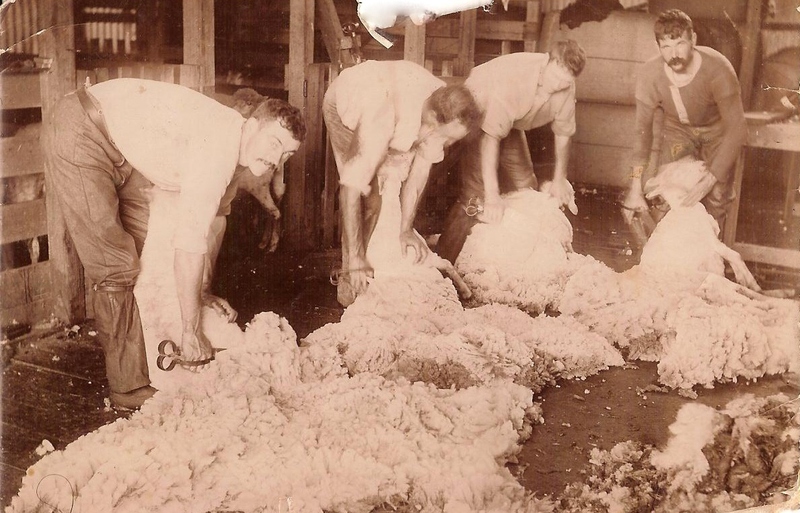 Residents used this extended holiday period to get out of the city and enjoy the countryside. The following extract comes from an article called “Christmas Cheer”. Along with instructions on how to boil a turkey, there were recipes for accompaniments such as celery sauce, oyster sauce and German salad. 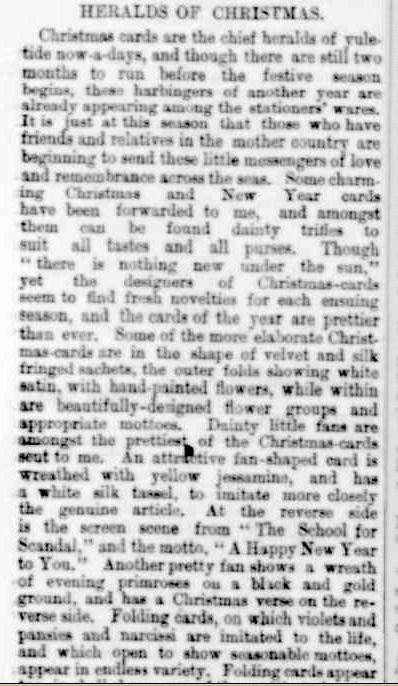 Christmas cards seemed to become more popular during the 1880s, and this article from 25 October 1889 describes some of the trends in cards. It appeared at the time of year cards were written to send to the “mother country”. 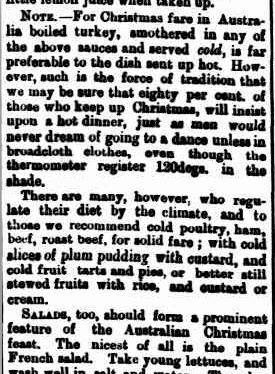 Just when I thought I was not going see anything of yuletide logs, the following articles from the late 1880s continue the now old arguments of why have a hot lunch during the Australian summer and why are people still persisting with the English traditions? This entry was posted in Pioneer Christmas, Western District History and tagged Christmas, Portland. Bookmark the permalink.